Oh yeah, we all know the theme tune and the images of blonde beach babes and the finely toned buff men clad in their tight red swimming costumes running down the beach in slow motion. It is what Saturday night were made for! 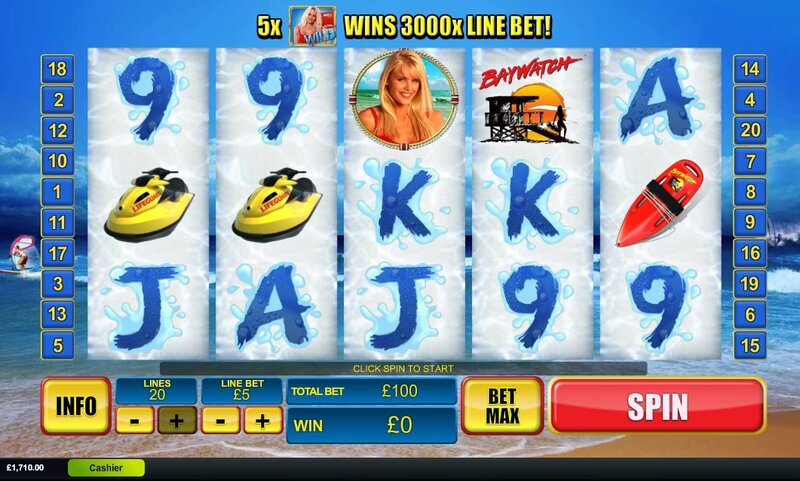 Now, praise the lords, Baywatch and all its buxom goodness has been released as a slot game title thanks to those genius minds at online casino software developer Playtech. All the classic characters from the vintage Baywatch era are here for us to ogle. Pamela Anderson (C.J. Parker), David Charvet (Matt Brody), Yasmine Bleeth (Caroline Holden) and Gena Lee Nolin (Neely Capshaw) all provide lovely visuals on the reels but enough staring! This is about the gameplay! Baywatch the slot has much more to offer than “T&A”, sun, sea and surf. The game has an incredible five bonus features and the gameplay is frantic from start to finish with plenty going on. This 5-reel, 20-payline slot comes with a free games bonus feature that is by far the most rewarding bonus feature in this slot. If you hit three Baywatch scatter symbols across the reels then you will trigger this bonus feature. Once triggered, you will be rewarded with 12 free spins and the middle reel is stacked with lifeguard symbols. There are three different lifeguard bonus features that are triggered when the middle reel becomes stacked. The Caroline Holden feature will award you with 6 extra free spins and a 3x multiplier. Wild symbols will also appear stacked in the middle three reels during this feature. In the Matt Brody feature you will be awarded with 6 extra free spins and Matt Brody himself acting as a Wild symbol. If Matt Brody appears on the first reel then he will remain frozen for the remainder of the feature. Finally, there’s the Neely Capshaw feature where you will be given 1x your initial stake bet, 6 free spins and a 2x multiplier. Every time Neely appears on the reels, your multiplier value will increase by one up to a maximum value of 8x. It should also be noted that if you hit three scatter symbols across the reels during the free games feature and the lifeguard bonus features then you will win an additional 12 free spins. There is no limit to the number of free spins you can re-trigger. This is only the beginning of the bonus features as well. There is also the Rescue Bonus feature which is triggered when the Rescue Feature symbol appears on the 5th reel. You are then given the choice of either choosing the C.J. Parker Re-Spins feature or the Lifeguard Mini Bonus feature. In the C.J. Parker Re-Spins feature, you are awarded with 1 extra re-spin but up to four extra Wild symbols can appear across the reels. Scatter symbols covered by Wild symbols also pay out as Wild symbols in this feature. In the Lifeguard Mini Bonus feature, you are presented with 15 lifeguard symbols covered in sand. You must uncover them to match three of the same symbol to win a prize. The C.J. Parker symbol pays out the highest reward that is 10x your initial stake bet. Baywatch is a slot that has been a long time coming. It’s a shame that there’s no David Hasselhoff but there is more than enough going on to make up for that. The range of bonus features makes it a very exciting slot to play that has longevity and vast playability in a similar way to Playtech's superhero-themed Fantastic Four. 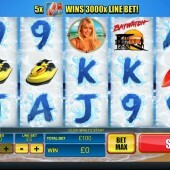 It can appear slightly confusing to begin with especially with the three lifeguard features attached to the free games bonus but it is simple enough to get to grips with. Baywatch certainly has the potential to be one of the best television to slot translations the slot industry has ever seen even possibly surpassing the awesome 100,000 Pyramid by IGT.